A microtiter plate was coated over night with TNFα at a concentration of 1 µg/ml. After washing and blocking with PBST+5% BSA, a pre-incubated mixture of golimumab (0.3 μg/ml) plus increasing concentrations of the non-inhibitory Type 2 Human anti golimumab antibody, clone AbD20897_hIgG1 in its monovalent Fab format, HCA242) or the inhibitory Type 1 Human anti golimumab antibody, clone AbD20710, HCA240) was added. 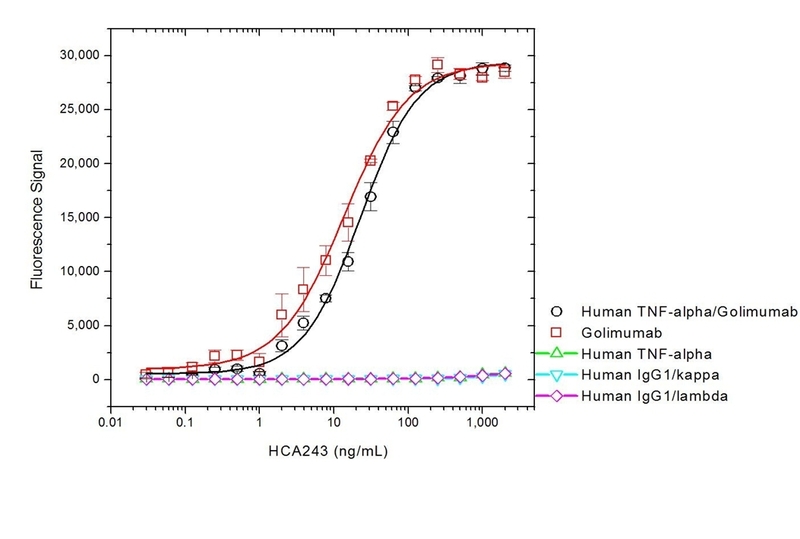 Free golimumab, still capable of binding to the TNFα-coated plate, was detected using Mouse anti Human IgG (Fc) CH2 domain:HRP (MCA647P) and QuantaBlu™ fluorogenic peroxidase substrate. Data is presented as the mean of three measurements. 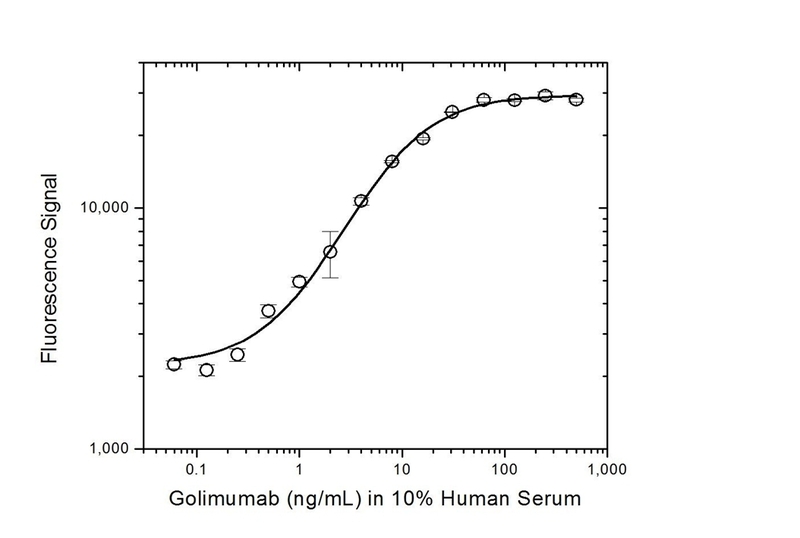 Anti-golimumab antibody is a recombinant, non-neutralizing anti-idiotypic fully human IgG1 antibody, suitable for bioanalytical method development for golimumab and biosimilars. It is suitable as the detection antibody in a PK bridging ELISA to measure total drug. Human anti golimumab, clone AbD20897_hIgG1 is a Type 2 anti-idiotypic antibody that specifically recognizes free golimumab and the drug/tumor necrosis factor alpha (TNFα) complex. Clone AbD20897_hIgG1 does not inhibit the binding of golimumab to TNFα and can be used to measure the total golimumab levels in serum from patients, or for pharmacokinetic (PK) assay development. This antibody is not suitable for the development and calibration of anti-drug antibody (ADA) assays. 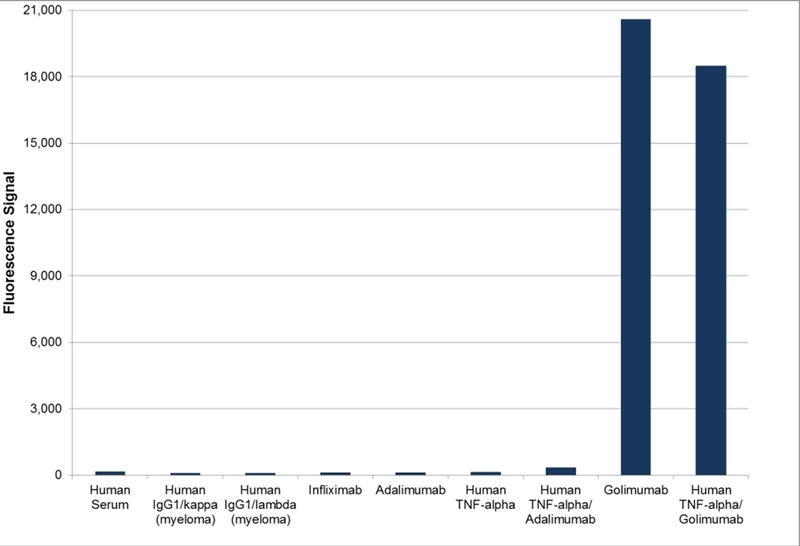 Golimumab, marketed under the brand name Simponi, is a recombinant human IgG1/kappa monoclonal antibody approved for the treatment of rheumatoid arthritis, psoriatic arthritis and ankylosing spondylitis. This therapeutic antibody, directed against TNFα, acts by blocking the binding of TNFα to its receptors, resulting in a down-regulation of the inflammatory response associated with autoimmune diseases. 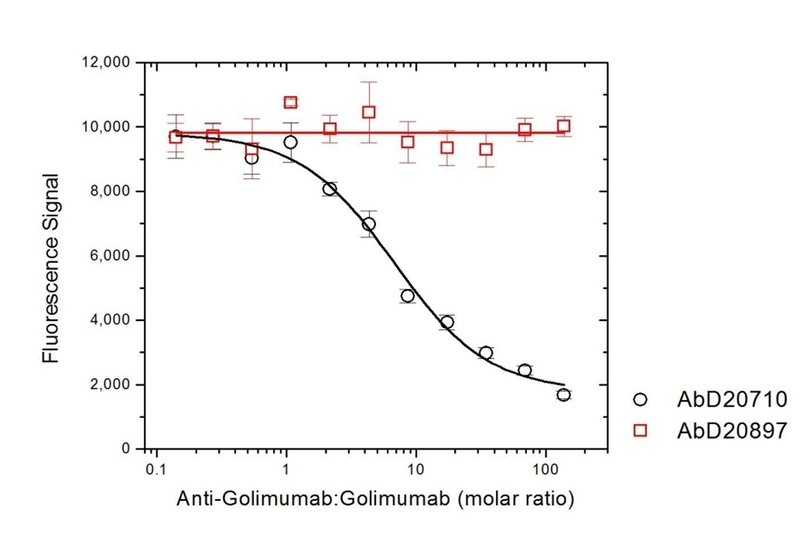 The monovalent intrinsic affinity of AbD20897_hIgG1 was measured as KD = 7 nM by real time, label free molecular interaction analysis on immobilized golimumab. Sold under license of U.S. Patents 6753136, 7785859 and 8273688 and corresponding patents. This antibody was developed by Bio-Rad, Zeppelinstr. 4, 82178 Puchheim, Germany. Simponi is a registered trademark of Janssen Biotech, Inc. in the USA and Merck & Co, Inc. in Europe.